After that doom laden first full day in NZ, the weather bucked up and produced another fine spring day for our next leg, to Franz Josef. A lovely trip, this, down the coastal highway, with the mountains on our left and many scenic reserves to drop in on. At Lake Mahinapua, the mists still lingered over mirror smooth water, reflecting the lines of forests and mountains rising beyond. The local birds seemed completely unfazed by the few humans around. A couple of flightless weka angrily (or hornily?) chased each other almost past our feet, while a rare kōtuku, or white heron, played statues in the shallows, then suddenly pounced on a minnow. A blue/black tiu, with its white ruff, fed on nectar from the flax plants. And some more familiar introduced types - blackbirds and chaffinches - sidled up looking for handouts. We visited a few more lakes and then returned to the coast at Okarito, a little settlement of holiday homes between a lagoon and a wide beach. The cliffs here are covered almost to the water’s edge with an impenetrable temperate rainforest, very lush. Big breakers lashed in from the Tasman Sea, everything seemed colourful, bright and fresh, a big contrast to the previous grey day. 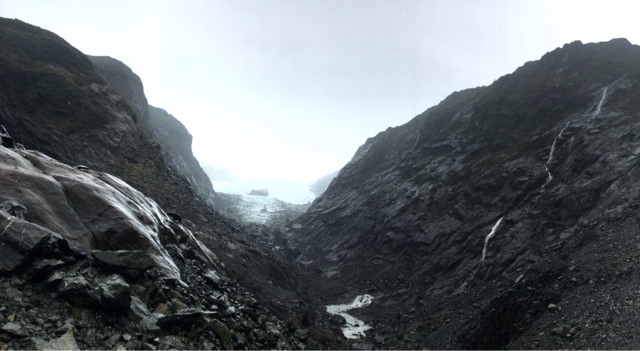 Finally to Franz Josef, right under the deep valley that holds the glacier. We ate outside in a pub restaurant as the sun set, barely colouring in the clear air of this unpolluted island. Next day it was back to grim, with a persistent drizzle shading into solid rain that lasted all day and into the night. Despite this we braved our way to the glacier itself, trekking through rainforest then suddenly out into the desolation at its foot. Is there anywhere else in the world where sub tropical forest sits cheek by jowl with ice mountains? We were soaked by the time we got back but thought it was well worth it. Clouds swirled round the valley, dozens of waterfalls jettisoned their torrents into the black abyss, and the ice hung far above us, dirty blue, now just a remnant of what was there 100 years ago, having shrunk back several km to reveal the dark granite, ground smooth and pulverized to fill the valley all the way out to the sea. A magnificent desolation. We seem to be lucky with our big travel days, because the next day was mostly sunny, as we drove further south. We stopped at Fox’s glacier, rather less forbidding under a blue sky. Further south, there are farms in the flat valley bottoms between steep sided foothills, but much of the country was inaccessible until well into the 20th century, and feels very remote. Occasionally the road comes to the coast, as at Ship Creek (I'm tempted to say we had a paddle!) where a magnificent beach is backed by NZ’s unique flora, providing an intriguingly alien treescape. Soon after that the road detours through a narrow gorge, the Gates of Haast, over a pass and down into a region of big glacial lakes. The mountains here are more rounded and have been long grazed by vast flocks of sheep, so that it feels a bit like Scotland. The weather even supported this, as the clouds started to build and throw passing shadows across the hillsides and shimmering patches of sunlight across the water. Here there are huge farms, dairy and sheep, at this time of the year brimming with calves and lambs. Lots of gorse and bracken. Wordsworth would have loved it. 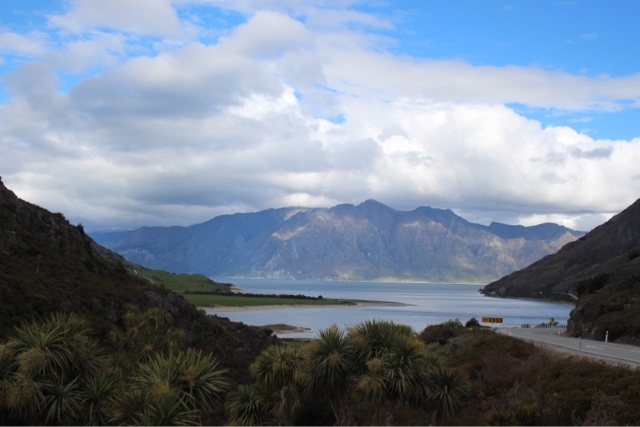 We drove along the shores of the lakes, eventually arriving at Wanaka where we had arranged our next stop.